He’s not too happy about the cold! The name Norwegian Paralysis may sound like it’s a description of the bitterly cold weather we’re having in the Chicago area, but it’s actually the name of our drink of the week! It’s unusual that a tiki cocktail would feature Aquavit, but the folks at Smuggler’s Cove in San Francisco came up with this delicious Aquavit-based tiki cocktail that we love. 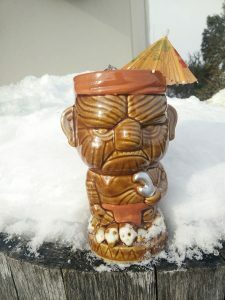 Shake ingredients with ice, then strain into ice-filled tiki mug. Garnish with a lemon swath and an umbrella, if you’re feeling fancy!